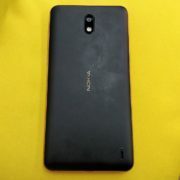 Godrej security EVE mini is the reliable solution, however, the price of the 6,499 is a tad high but still, you can’t neglect the features it offers including the brand assurance. Not waterproof (I can’t say it a con because it is a home mini camera, although, if you are planning for outdoor installation need to give it a cover from water). Price is a tad high. Godrej is a reputed brand whose name is enough to trust their products. It is an Indian based consumer product company that works in 80 countries including Africa, Europe, and America. It possesses multiple trademarks such as Cinthol, Hit, Ezee, Goodnight and more. Godrej also deals in security systems, home appliances, Kitchen appliances and more including security camera series. 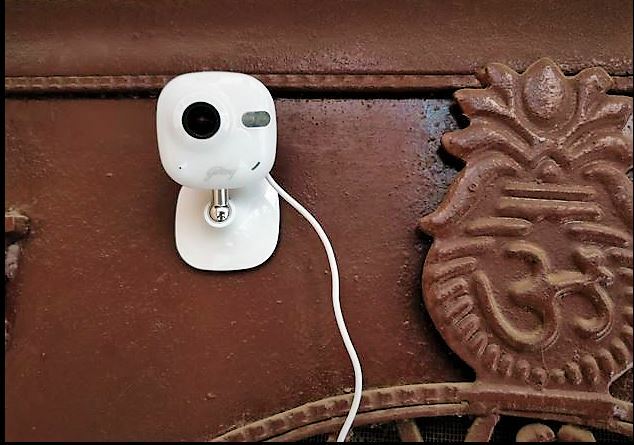 Besides the mainstream security camera, they have also launched a new series earlier this year called Godrej EVE; which consists of three primary models: Godrej Eve Mini, Eve Cube, and Eve PT. 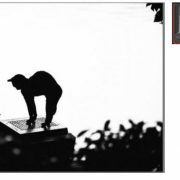 And here in this review article, we are going to talk about the EVE Mini which is the portable small in size security camera meant for personal, home and office usage. We used the Eve mini for more than two weeks and here is our review on it. The price of the Godrej EVE mini camera is Rs. 6,499. The Eve mini home camera is compact enough to fit within the expanse of your palm. 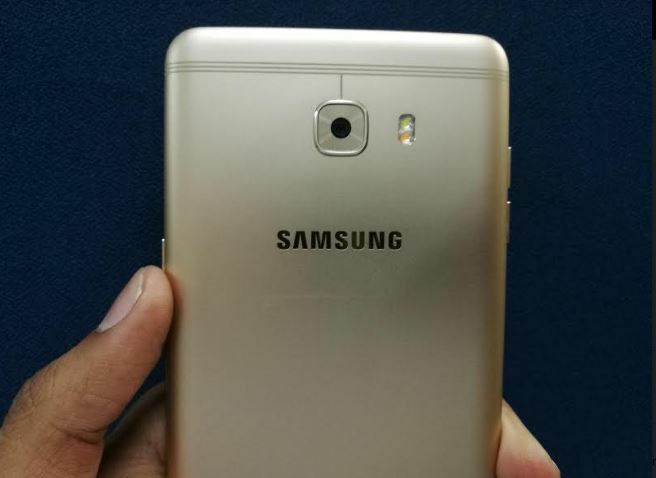 Its body is made of plastic with a glossy finish in white. 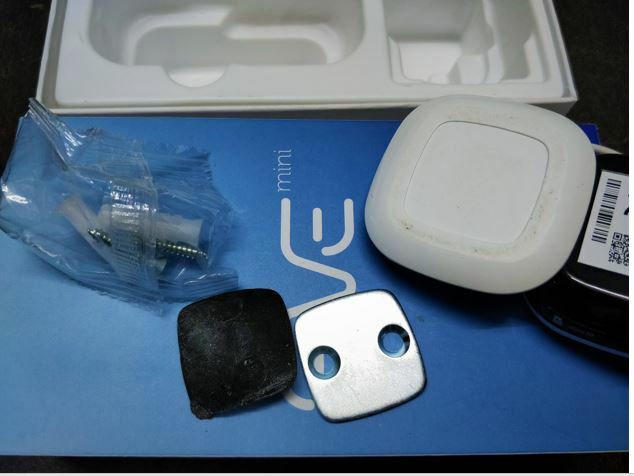 The camera module is packed in a square shape body along with Microphone for audio recording, IR Light and LED indicator. IR (infrared) Light: Auto light source for night vision. The video mode in the EVE mini has two functions: one is color for daylight or artificial light recording and the other one is black and white with IR illuminator for night recording. Steady blue: The camera is connected. Slow red flicker: The Wi-Fi connection has failed. Fast red flicker: MicroSD card error. The whole module of the camera is attached to a small metal rod with bob just like a pendulum. The swivel base of the camera gives it a 360-degree movement to cover any portion of the environment where the user set it up; however, the movement is manual. The plastic bottom of the camera has a metal plate and magnetized base that can attach easily anywhere without the need of any technician. The left side of the camera has space carved out for a reset button and microSD card that can support up to 64GB SD card for recording. On the bottom-right, you can find attached a USB wire which is 1 meter long. Note: To use the RESET button you need to press and hold it for 3 seconds while the camera is running. After three seconds the camera will restart and reset to default settings. Overall, the design of the camera is really good because of its small size which makes it capture movements and record them stealthily. Support both local and remote view with the help of internet connection. HD clarity in complete darkness because of powerful Infra-red LED’s let you see as clearly in the night just like dawn light. Magnetic base makes it easy to install. Easily manageable using the Godrej EVE app. Built-in Storage supports 64 GB micro SD card. Swivel Base with a 360-degree movement. Mobile Alert- The EVE Mini is motion sensitive which means it alerts your phone the second it senses movement on your premises. To set up the Eve Mini just take it out of the box and attach its USB cable to the adapter provided with the camera in the box. Plug the Charger into the power outlet and the camera’s LED will start blinking in blue and red color showing that it is ready to connect any Wireless network. Next step is to download the Godrej Eve mini app which is available for both Android and iPhone/iPad (iOS) smart phones. After downloading the app create your EVE account either using the email or mobile number right from the interface of the app. 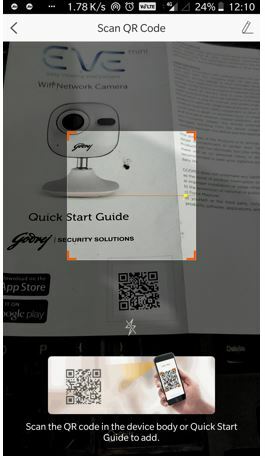 Once you have signed up successfully, the app opens the camera of your phone to scan the barcode & identify your The barcode is given on the EVE mini box, behind the camera module as well as on the front of the Quick start guide. You can scan any of them within 3 meters to add the device to your Godrej EVE account. 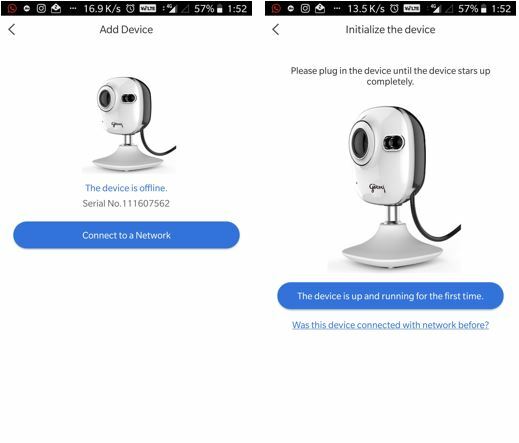 The app will identify the EVE device and ask you to connect the camera to a Wi-Fi network. Make sure your own smart phone is also connected to the same Wi-Fi network to which you want to configure the EVE mini. After connecting, the name of the device will appear on the screen of your Godrej EVE app. 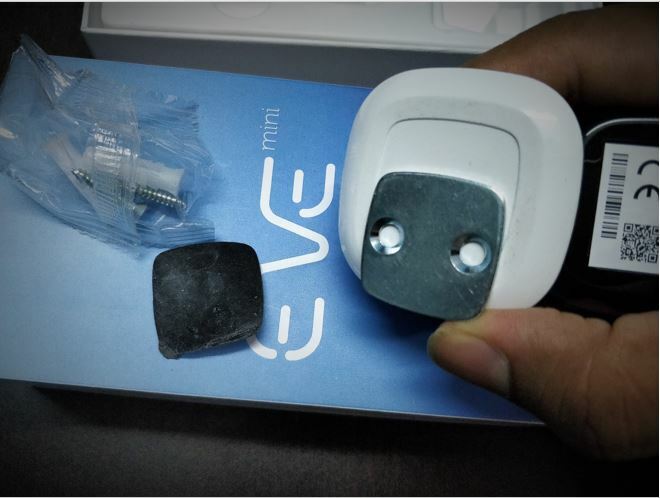 Once connected the default password of the EVE mini camera is the verification code given at the back side of the camera module. 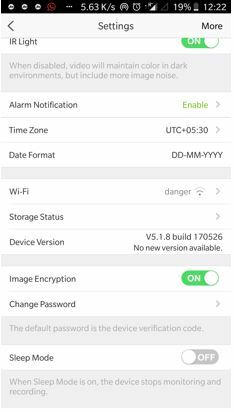 So, for security reasons, once you added it to your EVE account go to the Camera settings in the app and change the device password. The Godrej EVE Mini installation is very simple you don’t need to call some technician or electrician; you can do it by yourself even your young boy can perform the installation. Godrej has given two ways of installation one is using a metallic plate and the other one is using the foam sticker which has a strong glue. Furthermore, the camera itself has a powerful magnet at the base which means if you want, you can fix the camera on any metallic surface without the need of screws. However, if want to fix the camera on a non-metallic base, for example, the wall; you can use the screws and plastic white color ribbed anchor that comes along with the camera. Even I attached it to the wall without the help of screws by just using the glued foam. Installed on the metal gate with the help of its strong magnetic base. On the metal almirah inside the home. 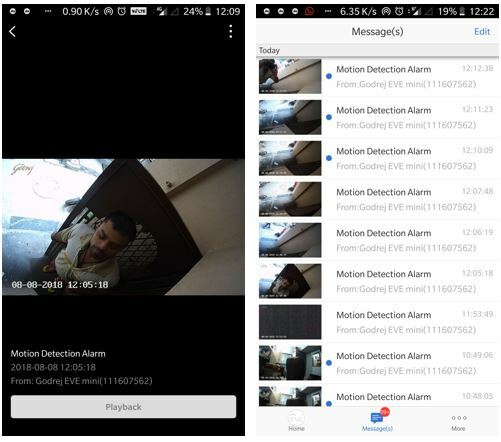 As I mentioned above that the EVE mini app is available for both Android and iPhone, thus it is not a problem for any user to operate and control it via smart phone. The interface of the app very has a minimalistic design approach with to the point options; without any confusing elements, as you can see in the screenshot given below. Audio: You can disable or enable the camera mic to record the audio while recording the live videos. Status light: On/off the LED status light of the camera. 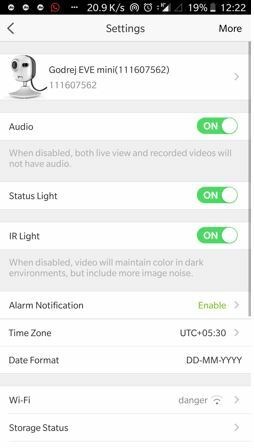 IR light: If you don’t want to record the dark scenes using the night vision of the camera then you can disable the IR light from here. 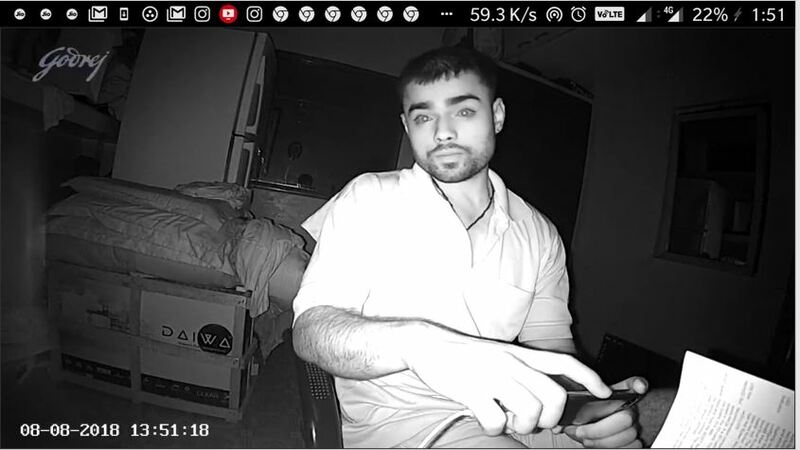 Alarm notification: The camera has an inbuilt motion detector, whenever an object moves across the front of the camera, it will generate a notification and also a sound. If you don’t want a notification Alarm then you can switch it off from here. Wi-Fi: Shows which Wi-Fi network is using by the camera. Storage Status: If you are using the microSD card then it will show the storage status here. For greater security, it also has the Image encryption option; so that it can securely be delivered over the network. Lastly, there is also a sleep option in case you do not wish to use the camera for some time. From the main screen of the app, you will see an option MORE under which you will get account related settings. My Album: All the recorded videos will show here. My Share: For sharing the device with some other person. Account Management: Manage your own profile, email address and other EVE account settings. Account security: This is the best option which is given on the EVE app to secure it from other family members or unknown persons. 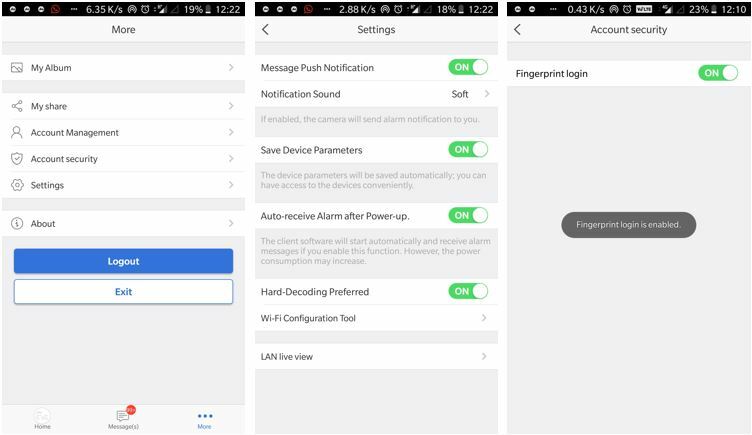 You can enable the fingerprint login for the camera. 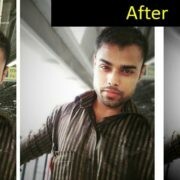 The image quality of the camera despite having only a 1 Megapixel camera is commendable. The video resolution of 720P is quite sharp especially the night video recording in the black and white. 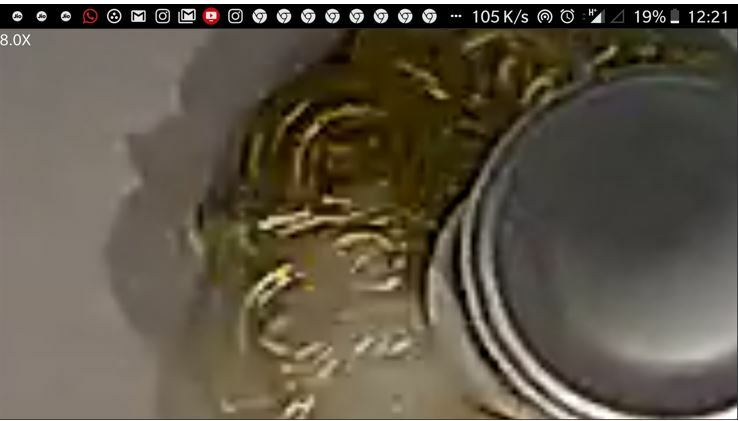 The 8X zoom view of the above image while viewing the live video feed. 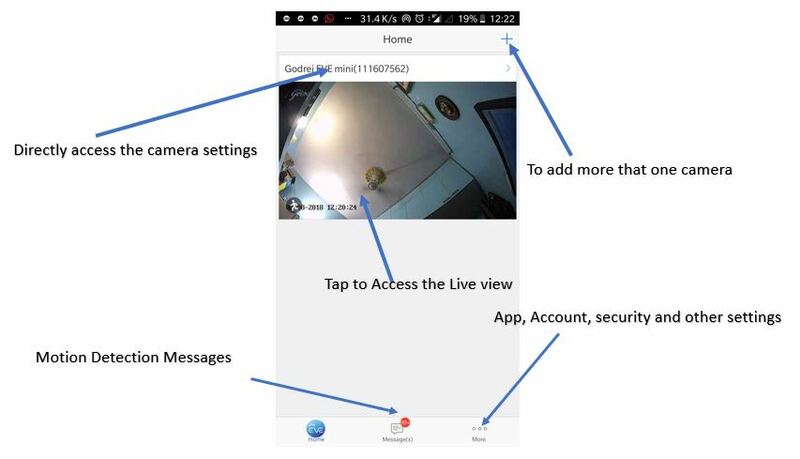 This means during the real-time live video the user can also pinch and zoom the video directly from the smartphone app screen. Because of digital zoom, the quality isn’t as great but you can’t expect much from the 1MP camera. The camera offers Motion detection feature too. It has two modes one is low sensitivity and other is high sensitivity. If you are using the camera for the large areas then use the low sensitivity and for smaller areas like a room use the high sensitivity. However, high sensitivity will push so many notifications because it can even detect the motion of the paper moving due to fan air. This feature is good for rooms where valuables are stored since it can detect the door movement too. 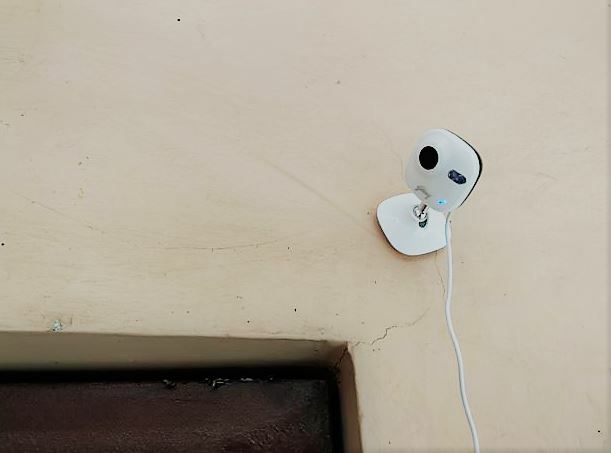 As I installed it outside my house, whenever someone rings the bell or tries to open the door, it gives me an instant notification on my mobile phone. Personally, I like the night view of the camera which is clear and crisp even better than the daylight. If you talk about the outdoor video quality then it quite sharp without any complains, still don’t expect some hi-fi quality from it. 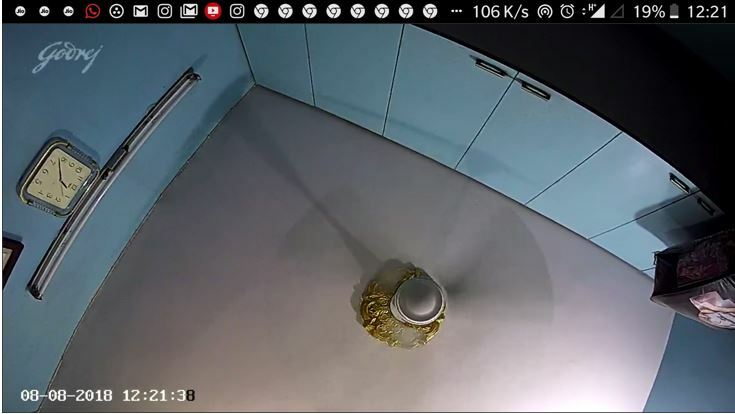 The other thing which I like in the Godrej EVE security camera is no lag, yes it gives you real-time refresh rate without any lag in the live or recorded clip. The video recording is usually saved in the microSD card, but if you don’t have that you can also save it directly on your phone using the Godrej EVE app. The audio captured by the camera is average but clear without any disturbance. 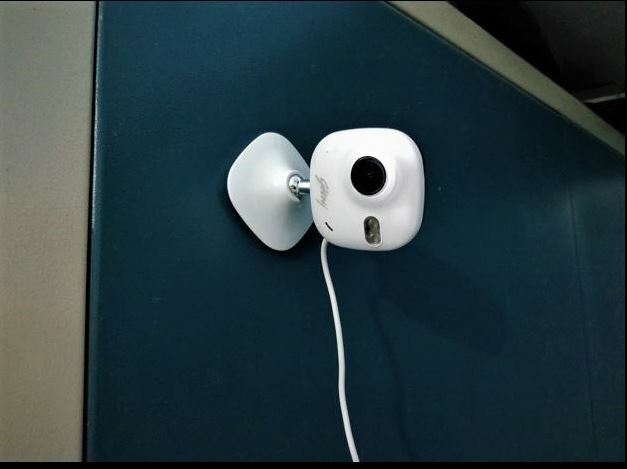 Godrej EVE Mini WiFi network camera can be useful in many cases such as you can install it in your children’s room to monitor their movement remotely while you’re in office, at the gate of your house, office area, storeroom, etc. The best part is that you don’t need to attach some external wire to it and also it is easy to install. Godrej security EVE mini is the reliable solution. The price of the Godrej EVE Mini is ₹ 6,499 which is tad high but you can’t neglect the features it offers including the brand assurance. If you ask me to recommend a personal mini security camera solution generally for indoor usage then Godrej EVE mini definitely be an option.